The partial government shutdown is hampering FBI investigations into terror suspects, drug traffickers and child sexual predators, according to a report by a group representing the federal law enforcement officers. The 72-page report, titled "Voices from the Field," features dozens of firsthand accounts from unnamed agents detailing the ways the shutdown is hindering their work. "I currently investigate a particularly violent street gang," an agent from the FBI's central region says in the report. "I have had to tell our local law enforcement partners that I cannot assist in funding these operations because my field office does not have money. This means that the one chance we may have to take down several violent individuals may pass us by and we may not get the chance again." An unidentified agent who works on counter-terrorism investigations says in the report that the shutdown has "eliminated any ability to operate." "It's bad enough to work without pay, but we can only conduct administrative functions while doing it," says the agent, who works in the western region. "The fear is our enemies know they can run freely." The shutdown has also stripped the department of the ability to buy drugs for narcotics busts and pay confidential informants, according to the report from the FBI Agents Association. "Not being able to pay confidential human sources risks losing them and the information they provide forever," an agent from the central region says in the report. "It is not a switch that we can turn on and off." The FBI's roughly 35,000 employees, including 13,000 special agents, are bracing to miss their second paycheck this Friday as the shutdown stretches into its fifth week. 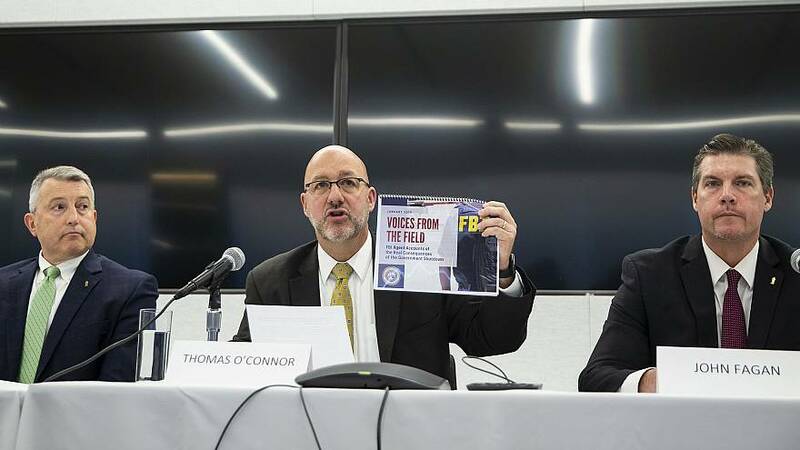 "That is one month, four weeks, 30 days without pay," FBI Agents Association President Thomas O'Connor said at a Tuesday press conference. O'Connor's voice began to quiver as he recalled bringing food to his office last night to help those in need. "It is truly sad that we must resort to this because we are being let down by our elected officials," O'Connor said. The Justice Department did not return a request for comment.